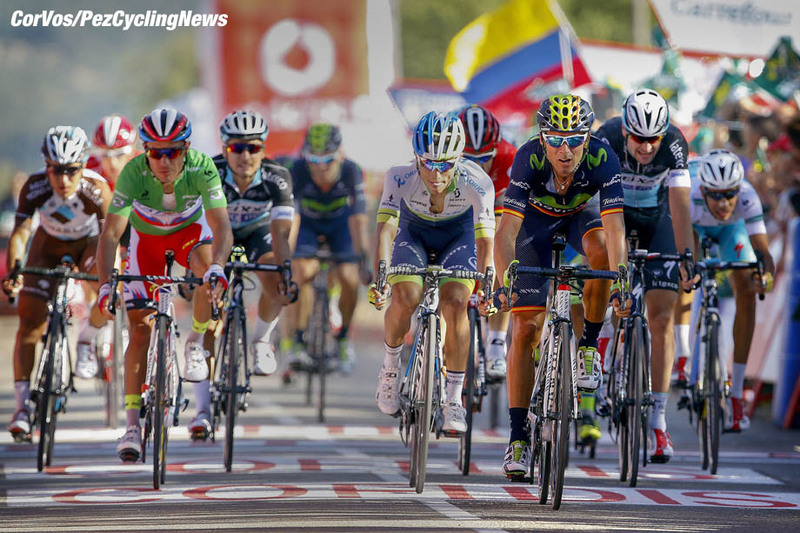 PezCycling News - What's Cool In Road Cycling : Vuelta’15 St.18: Roche Romps In Riaza! 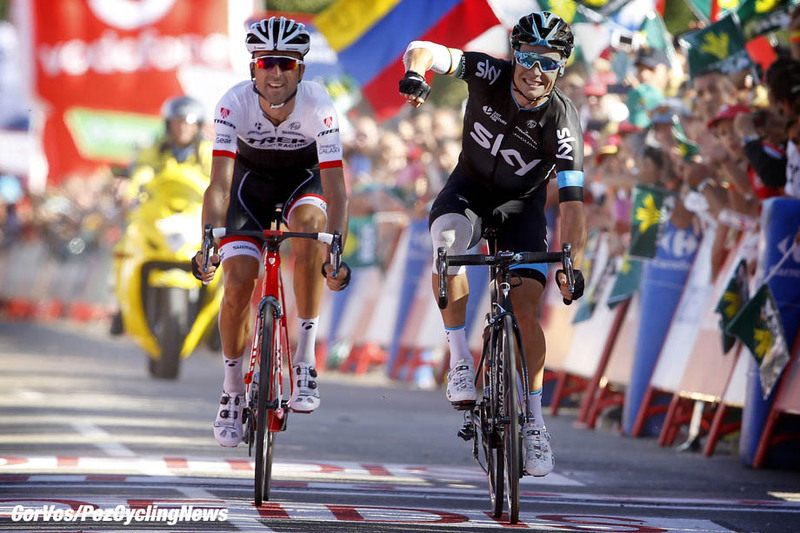 Vuelta’15 St.18: Roche Romps In Riaza! Race Report: Astana’s Fabio Aru has to take the race to overall leader Tom Dumoulin if he wants to claw back the 3 seconds he need for the final win. The Sardinian attacked, attacked and attacked again, but he could not shake the big Dutchman. At the head of the race Nico Roche and Haimar Zubeldia sprinted it out for the stage honors, with Roche taking the victory. 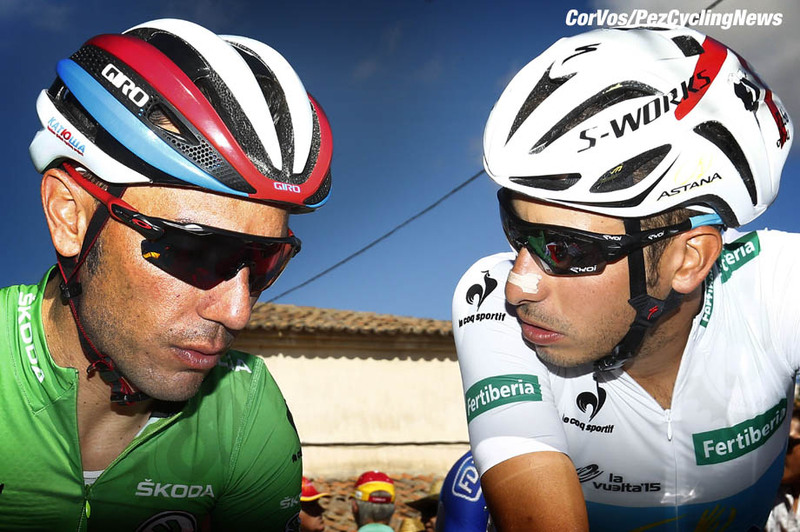 With only three days for Fabio Aru (Astana) to un-seat Tom Dumoulin (Giant-Alpecin) from the red jersey, the Sardinian has to take every chance he can and today he made many attacks, but gained nothing. The break of the day was big, 25 riders, it split and Nico Roche (Sky) and Haimar Zubeldia (Trek) crossed the final climb together and fought out the sprint with the Irishman edging out the Basque. 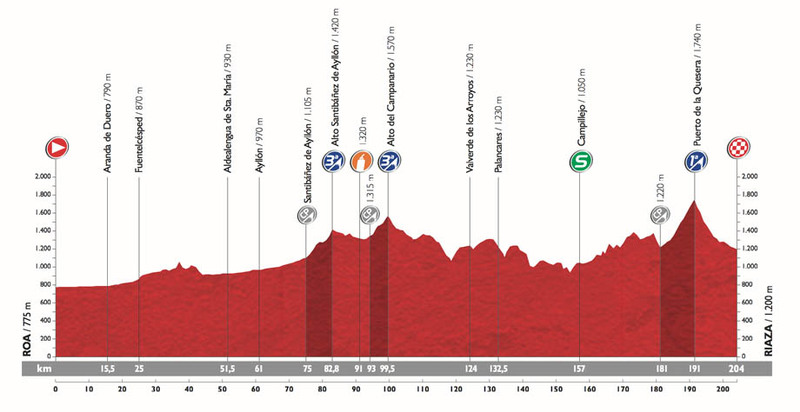 Stage 18 has three climbs, the first comes after 75 kilometers, the Cat 3 Alto Santibañez de Ayllón, nothing too steep, but the race climbs form the start. The second climb tops after 99.5 kilometers, the Cat 3 Alto del Campanario, but there is more that 100 kilometers to go to the finish in Riaza. The main difficulty is the Cat 1 Puerta de la Quesera, 10 kilometers long, climbing 520 meters with a maximum ramp of 7%. From the summit there are 13 down hill kilometers to the finish line. Quite a large list of non-starters: Andrew Talansky (Cannondale-Garmin), Peter Velits (BMC), Jurgen Van den Broeck (Lotto Soudal) Cameron Meyer (Orica-GreenEDGE) and Niki Terpstra (Etixx – Quick-Step). The start was fast causing splits, but Giant-Alpecin came to the front and settled things down, eventually a large group of 25 riders were allowed to take their leave of the peloton. The first hour was run off at over 50 kph. The break consisted of: Nicolas Roche (Sky), Sebastien Minard (AG2R-La Mondiale), Darwin Atapuma (BMC), José Gonçalves & Ángel Madrazo (Caja Rural-Seguros RGA), Cyril Lemoine & Dominique Rollin (Cofidis), Pieter Serry (Etixx - Quick-Step), Arnaud Courteille (FDJ.fr), Simon Pellaud & Vicente Reynés (IAM Cycling), Kristijan Durasek (Lampre-Merida), Bart De Clercq, Adam Hansen & Tosh Van der Sande (Lotto Soudal), José Joaquín Rojas (Movistar), Songezo Jim (MTN-Qhubeka), André Cardoso (Cannondale-Garmin), Jerome Cousin & Cyril Gautier (Europcar), Eduard Vorganov (Katusha), Tim Roosen (LottoNL-Jumbo), Daniele Bennati & Pawel Poljanski (Tinkoff-Saxo) and Haimar Zubeldia (Trek). After 65 kilometers the escape had a lead of 4:30 and with 130 kilometers to go they were touching 6 minutes. Best-placed rider was Lotto Soudal’s Bart De Clercq at 13:38, 14th overall. At the top of the first climb, the Alto Santibañez de Ayllón (Cat 3), Madrazo was first followed by Zubeldia and Hansen, the peloton had pulled them back slightly to 5:30. MTN-Qhubeka had taken over the chase to protect the tenth overall place of Louis Meintjes. It was Madrazo again taking the points to protect his Caja Rural-Seguros RGA teammate Omar Fraile’s lead in the KOM. Into the final 100 kilometers and the lead was still being held at six minutes. Under the impetus of MTN the lead was cut by 1 minute as the race entered the 70K to go mark. Not long after, Astana moved to the front of the peloton and the speed lifted to take the lead down to 4:45 as they neared 50 kilometers to go. At the intermediate sprint in Campillejo the lead was 4:51 with 47 kilometers to go, the leaders just rolled over the line without showing much interest. In the peloton, Fabio Aru was inline behind his Astana men as they did all the work. Katusha and Giant-Alpecin both had their men, Rodriguez and Dumoulin, next in line. This all must have been great for Movistar and Tinkoff-Saxo who were perfectly placed for any move and also sheltered from the wind and not having to do any chase work. Forty kilometers out and the lead was down to 3:38 all due to the hard work of Astana. There are no flat bits of roads in this area and the surface is heavy, none of those glacier smooth roads of the south of Spain. Up front Adam Hansen and Tosh Van der Sande were doing much of the work for the break to try and put their Lotto Soudal teammate Bart De Clercq in the top ten overall. Katusha’s Angel Vicioso jumped from the peloton on one of the many rises, the plan was for his leader, Joaquim Rodriguez, to join him, which he did, but Astana were having none of it and chased them down. Aru now only had four teammates with him, but then most of the GC men were in the same position as they hit the small hills before the big climb of the day with 30 to go to the finish in Riaza. As the escape approached the final climb, the pace lifted to drop a couple off the back, but the same had been happening in the peloton for some time and the chase was looking much smaller than previously as Astana kept the pace high. Eventually Gauthier and Van der Sande rode off the front of the break, but the effort was too much for the Lotto man and he dropped back to a fractured group. At 24 kilometers, Gauthier had 22 seconds on the group and 2:11 on the peloton which had approximately 40 riders left. At the start of the Cat 1 climb riders tried to jump across to Gauthier, this split the lead group even further and Astana was thundering down on them at 2 minutes and pulling in the dropped riders. Gauthier was struggling, but still managing to hold his slim advantage at around 20 seconds, by this point the break was down to around 15 riders. Purito: "What can we do Fabio?" Aru attacked at 19 kilometers, but Dumoulin was on his wheel as was Rodriguez and the other overall riders. The Italian didn’t wait long to put in another jump, but again the Dutchman was there. This split the peloton down to just the top men: Aru, Dumoulin, Rodriguez, Quintana, Valverde, Majka and Chaves. Aru gave another jump but the easing off allowed some of the other top ten riders to rejoin. Chaves was next to try; he was joined by Valverde and later Majka and Nieves. This move by Chaves looked good, but the others closed it down too. Up front Nico Roche caught and passed Gauthier with Zubeldia trying to join him. Aru attacked again on a slight rise, but Dumoulin was ready for the move and was on him as they caught most of the break apart from Roche and Zubeldia. Mikel Nieve (Sky) slipped off the front of the red jersey group as Valverde attacked the others, followed by another jump from Aru. The attacks were coming thick and fast, but Dumoulin was on to every trick. At the summit Roche and Zubeldia had 25 seconds on the remainder of the escape and 52 on the Dumoulin group of 11 riders. Quintana rode away at the start of the descent, but it was the red jersey who closed him down with 10 fast kilometers left to race. Zubeldia led the heavily bandaged Roche on the tricky drop in to Riaza, while behind the Dumoulin/Aru group caught the last of the break making a chase group of around 18. On a little rise Joaquim Rodriguez attacked, but was joined by Dumoulin, Valverde and then all the others and it was checkmate again. Into the final kilometer and Zubeldia was on the wheel of Roche and looked like he was ready to jump past the Irishman, but the Sky rider had the measure of Zubeldia and kept the speed so high that the Basque couldn’t get past him before the line. The sprint for 4th, as Conçalves had not been caught, was taken by Valverde after a lead-out from his teammate Rojas. Aru was very disappointed and rode through the finish area and kept going, ignoring journalists, fans and his team helpers. 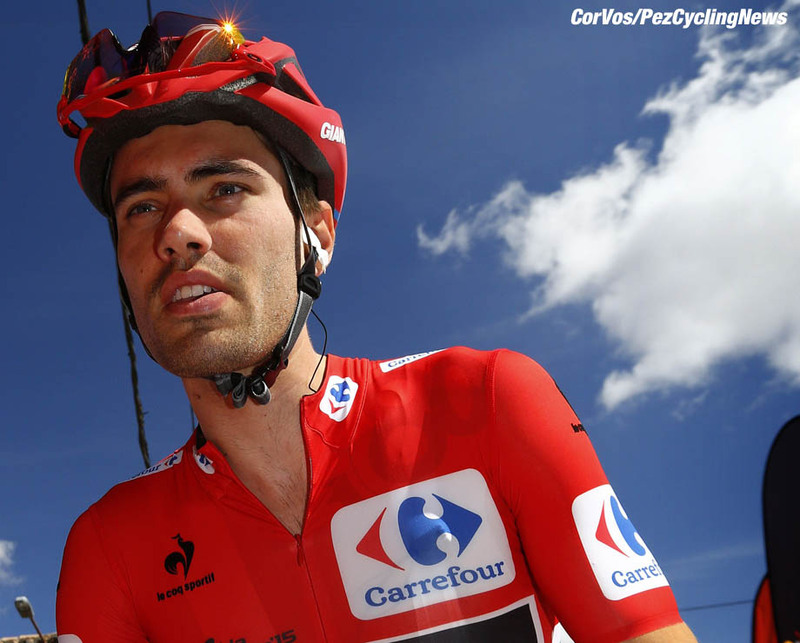 Dumoulin covered all attacks and looked comfortable doing it; Aru must be wondering what he must do to take the red jersey from the big Dutchman. Three days to go, keep it PEZ all the way to Madrid. 25. Eduard Vorganov (Rus) Katusha. 25. Haimar Zubeldia (Spa) Trek at 45:23.